Fly fishing has a tendency to produce fanatics, purists, and even some insufferable snobs. Sure, not everyone who picks up a fly rod goes down those paths, but it does seem that the percentage of practitioners of the long rod who are casual about it is lower than with other forms of fishing. From the moment I first picked up a fly rod, I knew I was onto something that was more than a passing interest. Fly fishing captured my imagination. I read books about it, I hung out in fly shops talking about it, I was always planning my next trip, and if there was a free day that could have been spent fishing but wasn’t, I would be grumpy about it. Apart from some of the snobbery that I tried hard to avoid, practically everything about fly fishing appealed to me. But sometimes even the things you really love can start to lose their luster. So what happens when you wake up one day and you realize that you just aren’t as motivated to get up and go fishing as you once were? Do you just chalk it up to being older and busier? There’s nothing unique about that, after all the bell of responsibility eventually tolls for every fisherman, except maybe John Gierach. Maybe what you really need is a new challenge; a new quarry to pursue, maybe some new terrain to re-ignite that spark you used to have. You could go looking for something like that; maybe plan an elaborate fishing vacation to some exotic destination. Or, life can put you in the path of something like that coming to you; migrating through the dark waters of the Pacific Ocean, up hundreds of miles of river, through a gauntlet of man-made dams, to arrive a short drive from your door. My decade-long campaign of assault on the trout of the Rocky Mountains drew to a close in the fall of 2005, when I relocated to Walla Walla, Washington. Come to think of it, the assault probably felt more like an occasional annoyance to the trout in my favorite streams for those last few years. The transformation (from a gung-ho twenty-something fly fisherman not long out of college who chose Colorado as a home base primarily for the fly fishing, to a responsible thirty-something business person who did little else besides work) was nearly complete. My six-day work week left little time for fishing, and when I did get a free day I was often too tired to do anything about it. Still, it seemed like there was more to my situation than simple time and energy issues. I was lacking motivation. It seemed that the challenge and the mystery of catching trout on flies wasn’t quite what it was in my early days with a fly rod. You might say that I felt like I had caught every fish within striking distance of Denver more than once. One could look at moving away from the Rocky Mountains as the loss of more trout streams than one could fish in a lifetime, but I chose to look at our move to eastern Washington as an opportunity. The little wine town of Walla Walla isn’t thought of as a fly fishing mecca by anyone. Still, there were lots of rivers around, big and small, and just about all of them had runs of steelhead. They were the fish of legend; impossibly large rainbow trout that could (supposedly) be caught on flies. The steelhead I had seen on the covers of fishing magazines made the trout I was used to catching in my favorite Rocky Mountain trout streams look like bait. If they could be taken on flies, I had to try it. Despite my renewed motivation to fish; I found myself quite busy with settling in to a new life with my family. It ended up being early 2007 when I finally had the chance to get out and try fly fishing for steelhead. The dead of winter in eastern Washington is… well, it’s cold. Perhaps not the best time to fly fish for steelhead (or anything else, for that matter). The fish can be lethargic in the chilly temperatures. Nevertheless, I tried several rivers, including making the three-hour drive to swing flies on the highly acclaimed Grande Ronde River, but didn’t hook a single thing. So went the entire season. Catching fish had long since become the norm in my world, and in good numbers more often than not, and so the idea of multiple fishless outings was a bit difficult to get used to. I hadn’t struck out that many times in a row since my days as a new initiate to fly fishing. Whether you’re used to it or not, an unbroken chain of skunkings like that can leave you with a number of questions. Questions like: Do steelhead exist? If you can be satisfied that they exist based on evidence aside from actually catching one, then you naturally move on to the next question: Is the rumor that steelhead will take a fly just an elaborate practical joke, akin to the proverbial snipe hunt? The times when I could go out fishing every week were long gone. I had a family, and when you have young children, the few days that you can slip away on your own to get in some fly fishing take on a whole new level of value. Spending them catching a whole lot of nothing can leave you wondering if there isn’t something more productive you could do with your time. All of these things went through my mind during that first winter of steelheading. A ray of hope kept me from abandoning the project, just in time for me to have to wait until the next fall to do anything about it. It was my last day out for the season, and I had pretty well decided that steelhead would not take a fly for any reason. I just happened to run across another fly fisherman on a little eastern Washington stream, and he was busy landing a steelhead as I walked up. It was a healthy buck of around six pounds. It looked like a larger, more athletic version of the rainbows that I was used to, with a trouty pink stripe down its’ flanks and some green showing on its’ back. It was beautiful, and at that point I would have traded a year of my life for just one fish like that. There was something about the setting, a tiny stream in a dry corner of eastern Washington, four hundred miles from the ocean, that made the presence of steelhead seem so unlikely. How could it be there? This was a saltwater fish. It was also a rainbow trout of a size that would make your season on any river in the Rockies. That stream looked like it would only hold moderate-sized trout at best. The whole idea had me virtually salivating over that fish. In that situation he probably could have told me that the fly I needed was a caddis emerger tied from the nose hairs of a Guatemalan fruit bat and I might have believed him. I needed something to give me some hope and some confidence. The fly he recommended wasn’t quite as eccentric as the Nose Hair Caddis. It looked like a pink grizzly-hackle woolly-bugger. He swore it made a difference, and I guess that was good enough for me. He was a very nice guy and offered to give me one, but the day was pretty much over. I thanked him and went on my way, already scheming about next season. The move to Walla Walla came with a career change for me. I was learning to make wine for a living rather than selling it, and fall was the busiest time of year. Getting out to fish for steelhead at the prime time was going to be difficult, if not impossible, but I would be ready if the opportunity came, with a fly box full of custom tied pink wolly-buggers. I even had a weighted and an un-weighted version. Not the most exciting fly to be sure, but it’s not always the glamorous fly that gets the job done. I would target the streams closest to home; the Walla Walla, the Touchet, and the Tucannon; three little tributaries of the Columbia or the Snake that are all about the size of a Rocky Mountain trout stream. I figured I could make that work to my advantage. The landscape in this part of eastern Washington is mainly rolling hills, often covered with wheat fields as far as the eye can see. In the spring they sway in the wind and waves ripple through them like an ocean of green. In the fall the stubble is a lifeless tan, and when combined with gray skies it can seem a bit bleak, until you develop a taste for it. The streams that wind through these hills are shrouded in brush and deciduous trees, making them easy to pick out in a landscape where trees are otherwise scarce. Weeds seem to love this part of the world, and making your way to a stream often means fighting through different varieties of thistles as tall as a grown man. Casting can be a bit challenging with heavy cover lining the rivers, and often overhanging branches make it nearly impossible. While the standing trees can get in the way of casting, the fallen ones make life even more difficult. Most of the time you can’t go very far on one of these streams before you come to a fallen tree in the river. If steelhead were really the runners that their reputation suggested, then I figured this could be a problem. It was late October of 2007 when I managed to get out to the Tucannon again. The river was a place in transition. Green-leafed trees that had not yet given in to the call of the season were interspersed with oranges and yellows, and alongside those were patches of leafless skeletons, foreshadowing the fate they would all soon share. Most of the riverside weeds had died off, leaving their tall, brown husks to guard the place from invading anglers. The sun was out but the air was cool and crisp; it was the kind of day that only comes along in autumn; the kind of day that you might spend wishing you could be out on the river were you not already there. I didn’t know the river well enough to put together the perfect strategy for fishing it, so I ended up just picking a spot and walking in. I fished the place like a trout stream, working my way upstream throughout the morning, which passed without any steelhead, though a couple of trout took my pink fly. That was encouraging, anyway. Afternoons go by quickly at that time of year, and shadows begin to appear on the river soon after midday. I didn’t have a whole lot of time left. Having made my way back to my starting point, I began the afternoon walking downstream, looking for spots that were likely to hold fish. Of course, there was a good-looking pool not more than twenty yards from where I had come in, hidden by a sharp turn in the river. Apparently I should have gone the other way. No matter, there was still time to fish. There was a fallen log near the head of the run, but the lower part below the log still looked good, with forty yards of open stream before the next set of fallen trees. That was a reasonable amount of space to play a fish on this river, and the hole looked like it had several lies in which a fish could park itself. Behind me was a patch of six-foot-tall bull thistles, but a good deal of space before there were any trees. I could cast normally as long as I remembered to keep my back cast high. A fish!!! Snags don’t thrash their heads when they get hooked, I actually had one! I paused for a moment, holding tight to the fish as I waited to see what it was going to do. It was slowly dropping back in the current, thrashing and shaking its head against the unseen force that was trying to pull it out of the water. I had the opportunity to take control of the fight, and I quickly reeled in my slack line so that I could play him on the reel. The head shakes were powerful, I was pretty sure this was the real deal. I checked my surroundings again, looking for the best place to land the fish. There wasn’t much room for error, if he got up a head of steam going downstream in the current below the hole he would make it to the next horrendous mass of fallen trees and that would be it. Most of the pool was shallow and clear, and as he emerged from the trough where he had been holding I caught a glimpse of the crimson stripe on his side. “Steelhead…” I said under my breath. Maybe somewhere a starting gun went off, or maybe he saw me the moment I saw him, but all of a sudden the fish turned and bolted downstream. I had no choice but to put the brakes on pretty quickly. If I couldn’t turn his head around he would be gone. I would get used to this kind of battle in years to come, and it can definitely go either way; but it’s very different from an area where you can let the steelhead go on a long run. I managed to convince him that going downstream wasn’t the thing to do, and the fight unfolded in the heart of the pool. I held my breath as he launched himself into the air, thrashing and spinning as he came down. I was on adrenaline overload, my heart pounding as I leaned on him as much as I dared. “Don’t lose him… don’t lose him… don’t lose him.” I was muttering to myself. He would be the reward of all of my effort if I could get him in, or a heartbreaking defeat if he got off. I had worked too hard to have it end in defeat…. I played him carefully, and far more nervously than any one fish would normally demand. When the fight was finally over and I knew I had him beat I eased him in to the soft current on the side of the pool and slipped my net under him. He was a hatchery buck that measured twenty-five inches, and weighed in around five to six pounds. He was still in good condition, but very colorful, with a deep crimson stripe dominating his flanks. His back was green, but not dark, and his belly had an orange tint to it that was more reminiscent of a brown trout. There was something about his colors that seemed in perfect harmony with the season. He looked like fall, fitting into the equation of the season as naturally as falling leaves or harvest festivals. I was smiling ear to ear. If you shout “wha-hoo” in the woods and no one is around to hear it, are you still a dork? Only once before had I ever worked so hard for one fish, and I think I reacted the same way to that one. The feeling of satisfaction certainly reminded me of the day many years earlier when I caught my first big trout on a fly rod. A six-pound hatchery fish is about the average for that system; hardly a huge steelhead, but it is a big trout by anyone’s standard. I was amazed at how strong he was. Everything I had heard about the amount of fight in a steelhead was true. I was in the middle of nowhere on a little tributary stream hundreds of miles from the ocean; and there he was, still strong, still determined to reach his goal. No one had caught and released him earlier that day, or yesterday, or the day before that. In all likelihood he had never been hooked before. I kept fishing for the rest of the afternoon without hooking anything else, but I didn’t care. I had finally taken a steelhead on the fly. Everything that I got from fly fishing when I was first learning it; the challenge, the mystery, the anticipation, and the moment when quiet, focused concentration turns into adrenaline fueled excitement in the blink of an eye; it was all restored and then some. 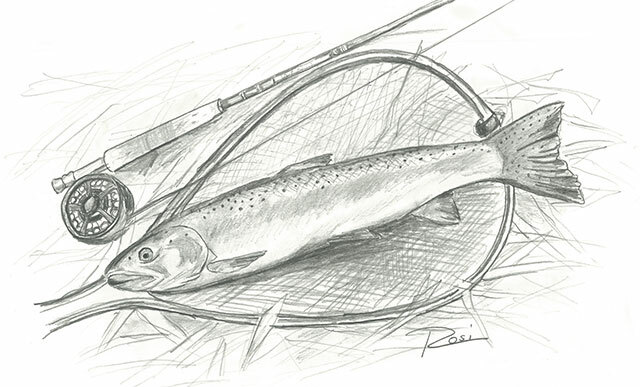 A Rocky Mountain trout fisherman was born again that day as a steelheader. They say that steelhead will find the same lies in a river year after year, generation after generation; so that your grandchildren may well catch fish in the exact same spot that you did decades earlier. The Tucannon’s steelhead must have gotten into my head, because ever since that first day in the fall of 2007 they return at the same time each year, finning in the same quiet pool in my imagination, just outside of the main current; drawing me back, defining the season. As difficult as it was for me to slip away to the river at harvest time during my years in Walla Walla, autumn wouldn’t have been the same without the Tucannon and its small but fiesty steelhead anymore than it would be without turkey or football.